Friday the 13th. The superstitious probably wouldn't have gone anywhere today, but I had to be back in the UK this weekend so, with some reluctance, we had to leave the pleasures of the beach for the city of Mumbai (Bombay). The morning was spent repacking and the afternoon flying by Jet Airways northwards back to Mumbai. It was an uneventful journey. Pintu, on his second flight, was now an old hand at this flying lark. Neither of us was prepared for the journey from Mumbai Airport into the city, however. The taxi which I'd arranged to meet us at the airport failed to materialise, so we took an air-conditioned cab with a meter, expecting it to cost around 400 Rupees. The traffic was ridiculous, however, and we spent ages in jams, resulting in a final meter bill of 700 Rupees (about £9). The journey took almost two hours! 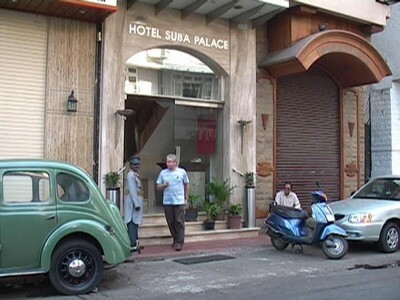 Our hotel here is the Suba Palace in downtown Mumbai and just a stone's throw from the Gateway of India. It's clean and modern, although a bit noisy at night - but Mumbai starts and ends late, so you can have a quiet morning lie-in before everything opens up at around 10.00a.m. It is almost as well situated as the super deluxe Taj Mahal Hotel around the corner but at a quarter of the price. The cost was a very reasonable 2,844 Rupees (£35.50) per night bed and buffet breakfast for two. The shower in our room was the best we've had on this trip and the coffee shop served very good Indian and Western-style food. We couldn't fault the service either. The city is still known by many Indians as Bombay - derived from the Portuguese phrase 'bom bahia' meaning 'good bay'. The name was changed to Mumbai (ascribed to the local goddess Mumba - 'ai' means mother in the Marathi language) by an act of parliament in 1997. The Gateway of India landmark is a triumphal arch built beside the harbour to commemorate a visit by King George V and Queen Mary, and ironically it was from there that the last British ship departed when the Raj ended in 1947. It's a city of over 15 million people and this vast overpopulation is evident in the slum conditions seen on the journeys from and to the airport. People living in tents, cooking by the roadside, sleeping in family groups on the streets. It is sad to see. Yet the city lacks much of the debris seen elsewhere, such as in Jaipur, where refuse never seems to be cleared away. Here, I actually saw a man sweeping the road and collecting up the litter. 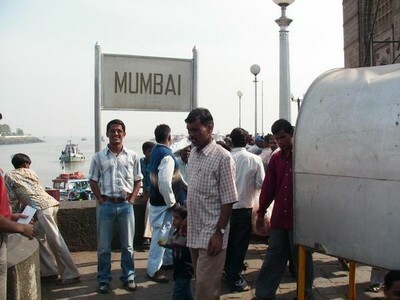 Next morning, we went for a walk down to the Gateway of India, a hive of activity and meeting place for all and sundry. Boats leave from here on trips around the bay and to Elephanta Island, where there's a rather grubby complex of caves filled with stone sculptures of Hindu gods, all carved out of the solid rock. I've got the t-shirt from many years ago. We didn't have time to take a boat ride anyway as Pintu had to catch his train to Vadodara this afternoon. Yes, today our time together had to end. We sat and talked for what seemed like ages about all the people, places and things we'd seen over the past two weeks. It had been a voyage of discovery for both of us. We had corresponded and exchanged photos regularly and thought we knew each other quite well, yet we had learned more about each other and our vastly different cultures in these two weeks than we had in the previous nine years. I had been privileged to have as my companion a caring, respectful and industrious young man and to be with him to see his reactions to so many 'firsts' - a first-class train journey, a flight, the sea, bikinis - all things which I and my own family take for granted. For me, it had been a joy to become acquainted with a real Indian family, visiting their homes, sharing meals with them, not seeing just a glossy veneer like a normal tourist. It had been a humbling experience to see India through Indian eyes, to see how so many have so little in comparison to ourselves, and to see how much they enjoy life in spite of everything. I may have occasionally called Pintu naïve and unworldly, but his love of life rather than of material things is what makes him and all the people of India so utterly adorable. It was an emotional farewell, said in the privacy of the hotel rather than at the railway station - I hate to cry in public! After putting Pintu into a cab, I returned to my room, watched television, slept, and next morning made my way to the airport for my return to the UK in the full knowledge that we may not meet again until Pintu's wedding day, whenever that may be. I could not end this blog without saying a big thank you to my family for indulging an old man by allowing him to make this journey alone, and to Pintu for being my friend. Wouldn’t it be wonderful if every young man had Pintu's sense of responsibility and respect for his elders? Pintu has bright brown eyes and a great smile, but he spends a lot of time in thought - perhaps too much so - worrying about the need for a good job to provide him with funds for his parents’ future and his sister’s marriage. He was puzzled to hear that, in our culture, it’s the other way round, with parents shelling out cash to help their children. He sees it as his duty to get a job which will earn him enough money to support his family. Education is his only way to that well-paid job - and that's why he usually spends every day studying from dawn until late into the night. I didn’t allow him to study all the time on this trip, and that troubled him. He has absolute respect for his elders. When greeting parents and relatives, he bends to touch their lower leg. He did this with me when we parted on our last day together. After showering in the mornings, he prays silently to the god whose image he carries on a cord around his neck. He normally wears gold studs in each ear - a tradition of his Rajput caste which he values highly. A cord is tied around his right wrist, put there by his parents as a token of good luck, and another around his upper arm, tied by his mother as a sign of affection and best wishes during his absence from home. He would never consider taking them off. I admire his qualities. If all our youth had them, Britain would be a better place indeed.